Built from the Red Woody platform, the Red Rocket includes key design upgrades for improved performance. We added a second pair of fin boxes to make it an A-Frame quad fin option and threw in the new Drop V tail just to make sure our big guy board can still rip the lip off the wake. This is the most technologically advanced large board on the market. Period. Ability Level: The ability level recommendation for this board is Beginner to Advanced. Tech Specs:5’6”x 22”x 1.75” 9 lbs. Weight Range: The weight range recommendation for this board is 100lbs. to 300+lbs. depending on wake size. Note: All surf style boards come with 1 pair of standard 9cm surf fins only. No other board delivers this level of performance for such a wide of range of weight and ability levels. We took the classic Blue Lake and added the new Drop V Tail for improved acceleration and tracking. Tech Specs: 5'3”-1.75”-21” 8 lbs. 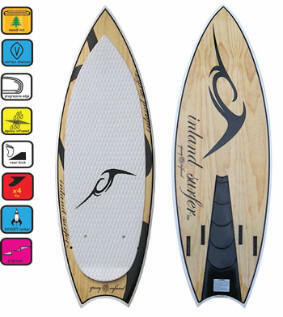 Weight Range: The weight range recommendation for this board is 100lbs. to 250+lbs. depending on wake size. We took the Swallow and added our new Drop V Tail and STEPtech for even more speed and release off the lip of the wake. With its advanced rail geometry and new design features the Swallow is faster and more responsive than ever. Ability Level: The ability level recommendation for this board is Intermediate to Pro. Tech Specs:5’3”x 20.5”x 1.75” 8 lbs. We took the ultra-high performance of the Sweet Spot and cranked it up a notch. We took the new Drop V tail and added our STEPtech to create speed as well as release off the lip. 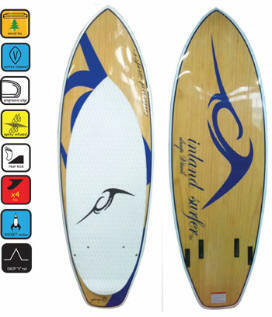 The board received a new more aggressive outline and 8mm of nose rocker to increase the attack angle as you edge up to the wake. Tech Specs:4’8”x 21”x 1.5” 7 lbs. 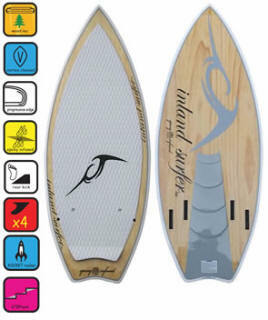 Weight Range: The weight range recommendation for this board is 150lbs. to 225+lbs. depending on wake size. The James "Flyboy" Walker signature is like no other board in the lineup. We used our new composite sandwich construction with healthy doses of carbon fiber and composite materials to achieve an ultra responsive, ultra light performer. This competition board is a must have for serious riders wheather you want to stand on the podium or just want to crush it behind your boat on your home lake. Tech Specs: 4'6" x 20.5" x 1.25" / 5lbs. WoodLoc - our process that inserts laminated layers of wood into the board top and bottom platform, to increase strength, rigidity, stiffness and overall performance. Vortex Channel - speeds up water and injects air near the tip of the board producing a faster board and avoids pearling (nose diving). Progressive Edge - The rail geometry and construction that holds the board close to the wake without creating unwanted drag. Compression Edge - Compression molded construction used to create a very durable board with added edge control for beginner and intermediate riders. Fin options - number of fin options available. Rear Kick - EVA traction with raised rear kick pad for incredible foot hold. ROCKET Rocker - This profile has been designed to provide the absolute maximum down-the-line speed without sacrificing edge to edge performance. STEPtech - creates a release point at the tail of the board for the water as it flows through. This means more down the line speed and better release off the wake for bigger airs. 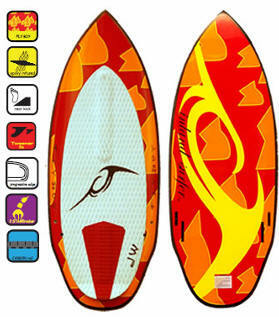 Drop "V" tail - provides maximum release of water tension from under the board. TUFFglass - Double layered fiberglass construction with cutting edge "T" stringer for maximum performance and durability. 3 STAGErocker - This is a 3 stage rocker profile designed for competition level performance. Ideal for quick and snappy turns and HUGE airs. Full Carbon - We added a layer of Carbon Fiber on top and bottom platform for added stiffness and strength. Carbon Rail - A layer of Carbon Fiber along the entire rail of the board for added strength and durability. 2010 WakeSurfing World Champion KEENAN FLEGEL 4-Skim Pro Model. 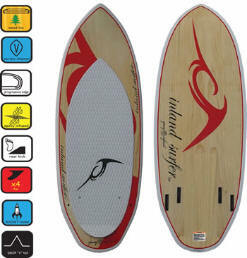 Inland Surfer's FlyBoy division, ultra light composite construction. James Walker Pro Model.